CENTRAL PARK — Cross-country skis, antique toboggans, snowboards, plastic pails and even trash bags were among the arsenal of play equipment locals brought to Central Park Tuesday to make the most of the fresh snow that blanketed New York City. Many park-goers were relieved that the winter storm hadn't delivered the snowfall levels and blizzard conditions expected earlier, but that there was plenty of powder for frolicking. Carrie Creasy, 29, an Upper East Sider who took her children, Rider, 4, and Leanna, 2, to the park was grateful the storm didn't "shut down the city," she said. At the same time, she would "love for it to snow a lot more." Snow "pretties up the city" and makes the cold more bearable, Creasy explained, while also making the city move a little slower. "I like the pace of it," she said. Her group was among dozens of parents and children sledding on a hill inside the park at East 72nd Street, just off Fifth Avenue Tuesday morning. A long slope near the Swedish Cottage on the west side of Central Park had bumps that allowed riders to catch a little air — and plenty of powder in the face. Mike, 58, an Upper West Sider who declined to give his last name, waited patiently to use his American Flyer toboggan, which he rode face-first down the slope. "I've had this my whole life," he said. However, Yagiz Yilmaz, 27, of Morningside Heights, and Ashley Barnes, 28, of Hell's Kitchen, were not as prepared. They visited a handful of stores Monday in search of a sled but came away empty-handed, opting instead for black trash bags to help them naviagte the hills. Yilmaz, who spent his childhood in New York City but lived in Arizona and Florida until this year, said he was happy to be back in the Big Apple. "It's been fun so far," he said of the visit, noting he was up and itching to go by 7 a.m., and that they chose the 72nd Street transverse after doing some quick Googling of the city's best sledding spots. Runners and even a few few cyclists used the partially cleared Central Park Drive, joining a handful of cross-country skiers out for some exercise. 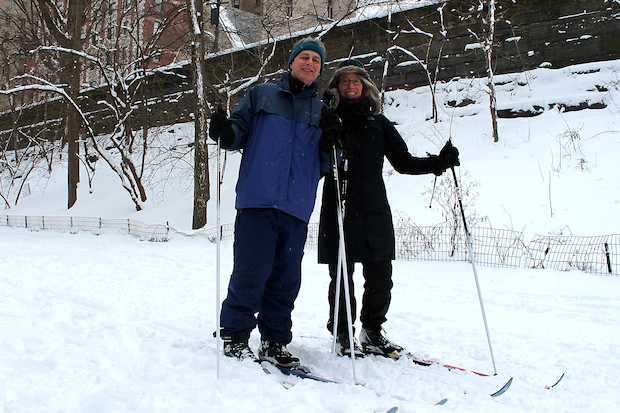 David Karnovski and Sue Kaplan, both 58, only get to use their cross-country skis a couple times of year at most in New York City, but when they do they follow a 6-mile loop along the Bridle Path, which remained unplowed Tuesday morning. "You have to just be ready to jump out at any moment," Karnovski said. While the majority of children in the park had sleds or inner tubes in hand, a few got work on snow creations — from snowmen to forts. On Tuesday, however, the snow proved the wrong consistency to really define presidential features, noted Riley, an Upper West Sider who attends the Delta Honors program at P.S. 54. Instead, they built a snow tunnel to climb through, in between pummeling each other with fists full of the white stuff. "I'm really happy to have the day off," Riley said.